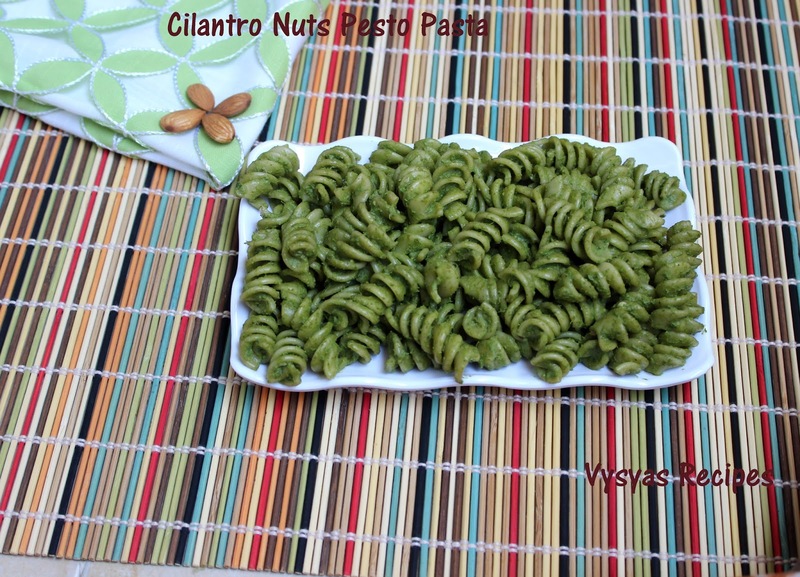 Cilantro Pesto Pasta is an Easy Pasta Recipe, made with cilantro and some nuts.I used Rotini Pasta Type. Rotini is a type of helix- or corkscrew-shaped pasta.its tight twists help them retain a wide variety of sauces better. They are often used in pasta salads with pesto, Carbonara or tomato-based sauces.Today i used with Pesto. This Recipe is taught by my friend Durga.Cilantro's deep-green leaves possess good amounts of antioxidants, essential oils, vitamins, and dietary fiber.Cilantro leaves helps in relieving gastrointestinal problems.Cilantro acts as a natural internal deodorant as it contains a large amount of chlorophyll that can detox the body,by flushing out toxins from the liver, kidney and digestive tract.Yummy pasta when blended with cilantro pesto tastes awesome. Cook Time : 10 - 12 minutes . Pasta of your choice - 1 cup. Take the water in wide vessel and bring water to a rolling boil, then add Pasta, cook till Al dente. (pasta should be firm to a bite). stir now and then, to avoid pasta gets sticking to vessel. Then drain it in a colander, and Pour cold water over it, to avoid it getting cooked further. Cilantro - 1/2 cup(tightly Packed). Soak Cashews + Almonds for 15 - 20 minutes in a hot water. Then Grind Everything to a fine Paste. 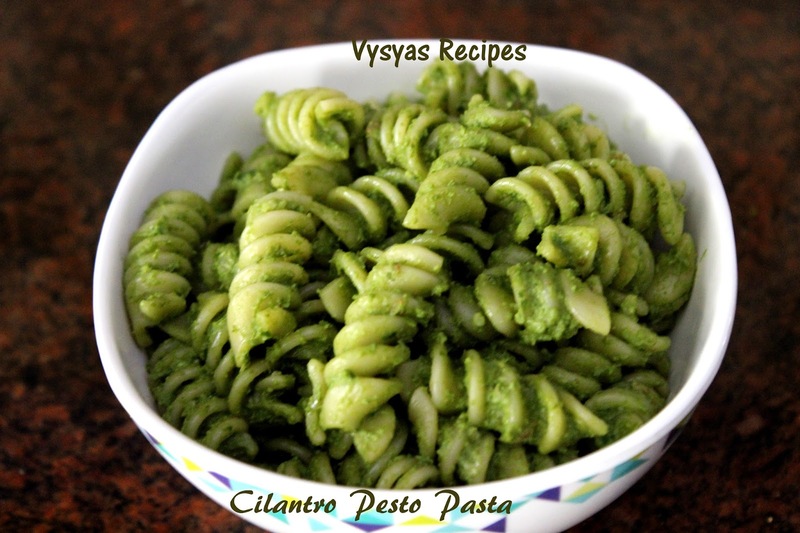 Take a Wide Vessel and Mix Cooked Pasta with Pesto together. Serve. I used Pasta of type Rotini. you can use any type of pasta. 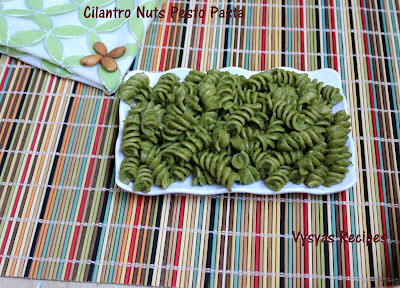 Adding nuts enhances the flavour of Pesto. It is not necessary to saute green chillies, just add as such. Taste won't give up. This cilantro pesto can be used as a spread inside Sandwich.